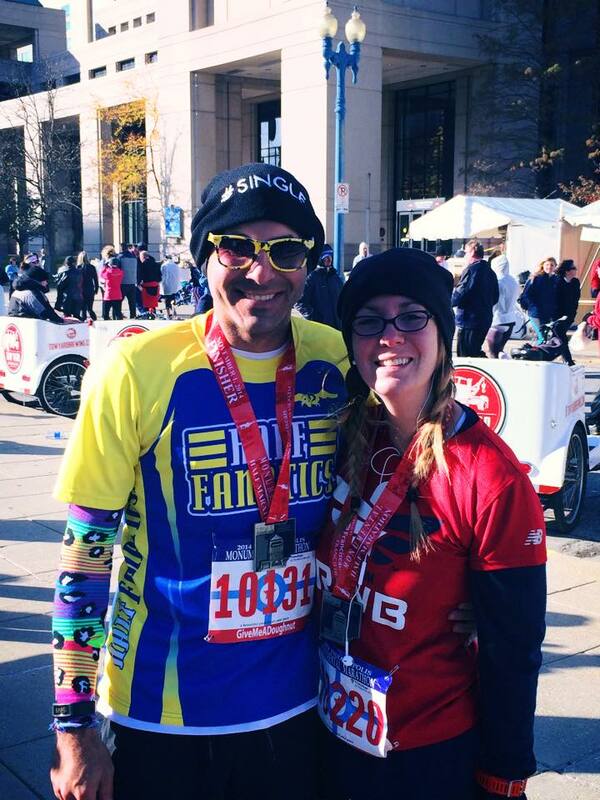 Indianapolis Monumental Half Marathon was on November 1st, 2014 and I had planned on a rather lofty PR. Everyone kept telling me how fast and flat of a course it was so I was shooting for taking 6 minutes off my time (which would give me a 2:30). I knew it was going to be cooler than my last half I PR’d at which would help me and although I wasn’t exactly looking forward to a completely flat course, I figured it was going to help. I got up to Indy around 3 or 4 on Friday and went to the expo which left a lot to be desired. It seems that no expo I go to holds a candle to the Flying Pig’s expo but maybe one day I’ll find one that compares. 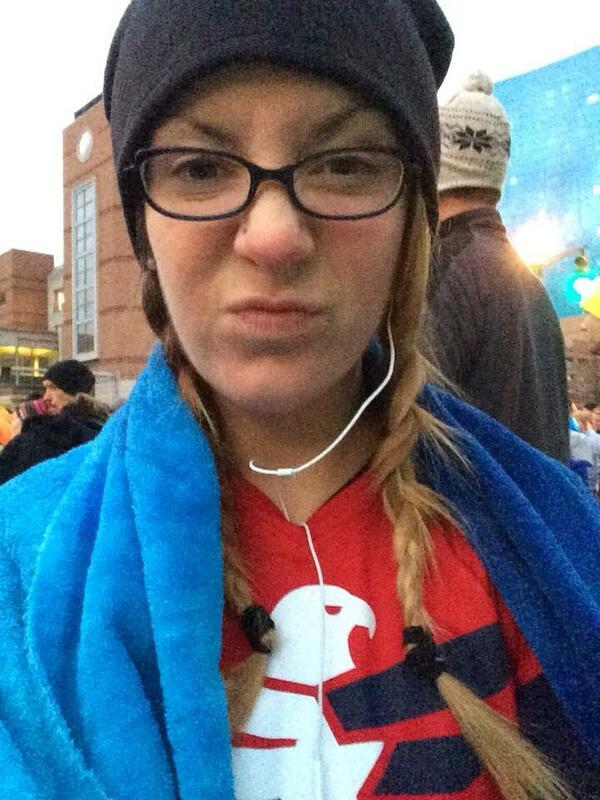 I basically just ran in, got my shirt and bib and got out. I had friends that were up there running either the half or the full and a group of them ended up being in the room across from me and offered me a beer to which I said, of course. I was quite hungry and originally we had thought we had reservations with our training group at 5:30 but there was some confusion and it wasn’t until 6:30. I couldn’t wait so my friend McKenzie who was running her first full and I went to TGI Friday’s and grabbed dinner around 5:30 or so. I ended up getting a salad, mashed potatoes and steak. Steak just sounded really good. After that we decided to meet up with our training group that were having dinner at Buca Di Bepo, it was a far walk plus it was freezing and raining so we took a cab. I only stayed for a little because I had friends (see: ex boyfriend) at another hotel who were running the race and wanted to see them too. I walked from Buca to their hotel which may not have been the wisest choice as it was REALLY cold and REALLY windy. Plus it was about a 10 minute walk and I probably shouldn’t have been on my feet as much as I had been. I met up with them and had about 1 1/2 glasses of wine and got a ride back from my ex to my hotel. I drank a bunch of water and attempted to go to sleep. I never have trouble sleeping but for whatever reason, I was wired which is surprising given the 1 1/2 glasses of wine. I’m unsure of what time I finally fell asleep, maybe 10:45-11:00 and when I woke up, I recall feeling like all I did was flip from one to another the whole night. It wasn’t that I was exhausted or anything, I just felt like I flipped and flopped the entire night. I didn’t have to wake up super early because my hotel was so close to the start line so I ate the english muffin and cream cheese I brought with me, handled my business, drank some more water and got ready. My friend Doug who was pacing me was in the lobby of my hotel around the time I was finished getting ready waiting to take a picture with the Marathon Fanatics group so I went downstairs and met up with him. Snapped a couple of pictures for them and we made our way over to my training groups tent so I could ditch my gear. It was very cold so I wanted a hoodie for afterwards and we also were dealing with 20 mph northly winds that I would be running into for the first 6-7 miles. I told Doug this and he decided to switch up the plan and we decided to run a little bit slower in the start since we’d be pushing against the winds and at mile 7, they’d be at our back the whole rest of the way. Using my throw away blanket before the race. 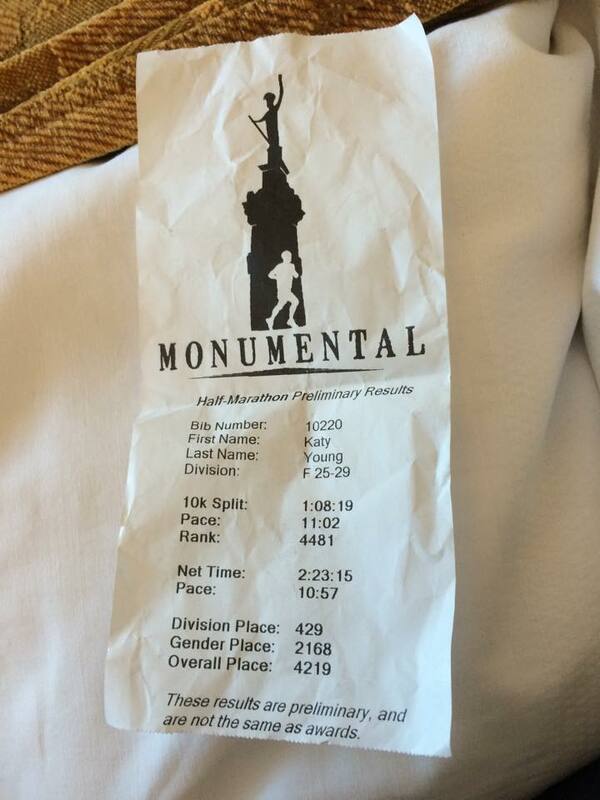 There were no corrals for some reason except for the elites so it was just a jumbled mess. We found the 4:30 full pacing group and decided to just start there. We crossed the finish line fairly quickly given the no corral thing. Once we started, I honestly didn’t feel the winds as badly as I thought I would. I even said pretty early on, before we even hit 2 miles I believe, “these winds aren’t that bad, hope I don’t jinx us..” but I didn’t. Either they were blocked pretty well by everyone around me or the buildings, I don’t know but only occasionally did I feel them. The water/aid stations were kind of a disaster for this race. There were no signs or volunteers telling you what was what and I quickly realized there was no nutrition whatsoever on the course. By the time we got to where there was a goo stop, they were completely gone and no one was even manning the table. Thankfully I had thought to bring ShotBloks with me and I took some at about mile 7. Really everything was going well until probably mile 6 or 7. I had pain in my right hip which I think was from me babying my left IT band and I knew that I either had or would have by the end of this thing a gnarly blister on my left ankle. Unsure of why or how because I’ve ran in these socks and shoes plenty but I could feel it. I kept ignoring it because I knew a) there was nothing I could do about it, b) there was no one around to give me a band aid had I wanted one and c) it was going to hurt with or without the band aid. My friend Brittney ended up running with Doug and I once I told her what we’d probably keep our pace at and I remember a few times her asking Doug, “what are we shooting for?” “what are we on pace to do?” because she had been looking at her watch and I think she realized that the 2:30 wasn’t adding up to what we were doing. Basically, Doug, my pacer, lied to me the whole time (not even mad) about what our goal was and what our pace was. He went based off of my ability to talk and my expressions. I have/had a watch on but because I was running with him and basically by his guide, I don’t think I ever looked at it once until mile 12. Mile 7-11 is kind of a blur. I literally don’t remember much of what was happening around me, by mile 10 or so, I kind of got into this groove where I wasn’t going to be able to go faster and I wasn’t going to slow down and by god, no one better get in front of me because I wasn’t stopping. Around mile 10 or 11 was when the elite marathoners started coming in, police on motorcycles came up on our right and soon after so did the elites which was pretty cool to see and also aided in getting through those next couple of miles. Doug had said that he was gonna make a push when we got to about mile 12.5 and finish early so he could take pictures of me finishing, I said that was fine. When we got to about mile 12, he asked me, “You’re going to PR and you’re going to be surprised no matter what, you just need to decide by how much. Can you pick it up or are you going to stay here?” I really didn’t feel like I could run much faster so I stuck with where I was. I really look like I am struggling here. 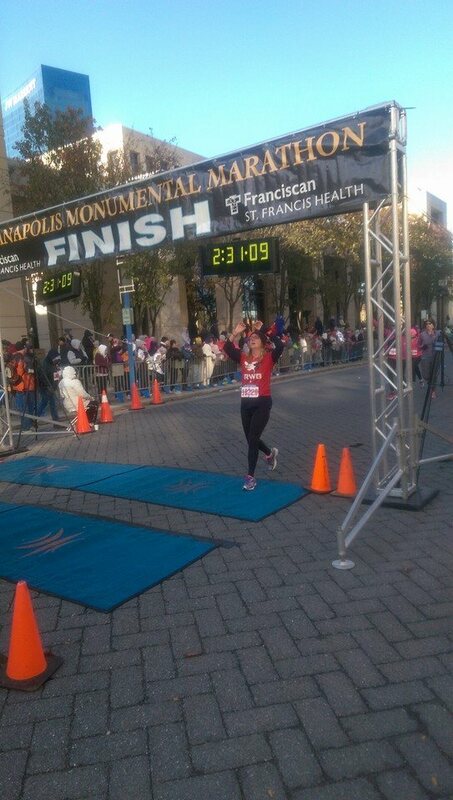 I ended up crossing the finish line at 2:23:15, THIRTEEN minutes off my PR time. I was gunning for a 2:30 and I just smashed through and landed myself a 2:23. Not going to lie, I’ve never felt like how I felt after the finish. My legs were literally wobbling underneath me, I felt like if I didn’t sit down, I was going to collapse. I completely lost Doug in the whole thing, I saw him before I crossed but once I crossed, I grabbed my medal and made a bee line to where I could sit down. Some of my friends who had already finished were right outside the gate near a curb so I literally just laid down on the cold concrete. I asked one of them to take my left shoe off and sure enough, bloody sock, bloody shoe, no skin left on the heel. They also had a beer waiting for me which I must say is way better than any water or banana at the end of a race. My wonderful pacer in his brightly colored glory. I wish I were able to be more excited about my time. I mean, of course I was excited but I have this bad habit of just always gunning for something better. I knew that I only did that because the course was flat and it was cold, had it been May and the Pig Course, I’d never be able to run that time and I guess that’s where I just get a little down on myself. I wish I were able to run that “fast” (fast to me) all the time. I even negative split it, I was doing 11:02 at the 10k mark and my net pace was 10:52, still probably didn’t celebrate as I should. Of course I am proud of myself but I compare myself to others and others are much more faster than I. But there is something to be said for the fact that I finished my first half marathon in May of this year in 2:37 and was able to knock off 14 minutes from that time in 7 months. I’m hoping that the built up endurance and my continuous runs from here on out will only make me a stronger and faster runner. I’m now in transfer to trail running mode as I signed up for a 25k trail race in April and I’ve never once ran trails before. I bought the shoes, I just need to find the time for trails. I’m looking forward to seeing how I transition to them and how it helps out my road running come spring time. I know it uses a whole different set of muscles than road running does so it’ll be nice to strengthen muscles that I’m likely not used to using when running. All in all, Indy was a nice experience. The city is really great and there is a lot to do in just their downtown area, I was surprised at how nice and busy (in a good way) it is there. The race itself was alright, I’ll be back because it’s a fun time, because my friends always go every year and because it’s a great place to PR but the race could use some touching up in my opinion. The broken/cracked roads, the brick roads at some points and the lack of nutrition on the course were some of my biggest problems with it but as a whole, it was definitely a great and fun experience. Wow, awesome PR! It feels so good not only to get a PR, but to totally smash it and you did! Great job!